UPDATE: Fixed the RSS feed icon. Excellent job Wicked. Keep up the wonderful work and thank you. Excellent. Very tight theme. Again, superb work. Very nice - about time more people start making Firefox themes! Nice Wicked...the Firefox section is ever so grateful. Is there a tutorial for making these skins anywhere? 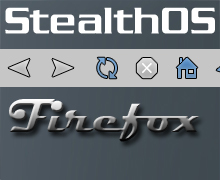 I have no problems with themes on the firefox website. But having extracted the jarfile from your downloaded zipfile I cannot install it in to Firefox. Whatever I try all I get is "Invalid or corrupt jarfile". So how do you install the theme ? Thanks in advance. You have to open the Themes Dialog box, and than drag-n-drog the .jar file on the left panel of that dialog box. I found an Extention called "Local Install". It will add a "Install Theme" selection to the File menu. Extract the sp2k5.jar file to your harddrive, and then use the "Install Theme" menu selection to locate that file. Thanks for the info. Worked a treat. I'll go check out the extension you provided the link to. This theme and the SkinPlanet theme do NOT show the RSS button in the lower right corner if the site has RSS feed enabled for updates. Wincustomize does use the RSS, so you should see it in lower right corner. Thanks, Littlemutt...I meant to fix that before uploading this...oh well. It's fixed now.